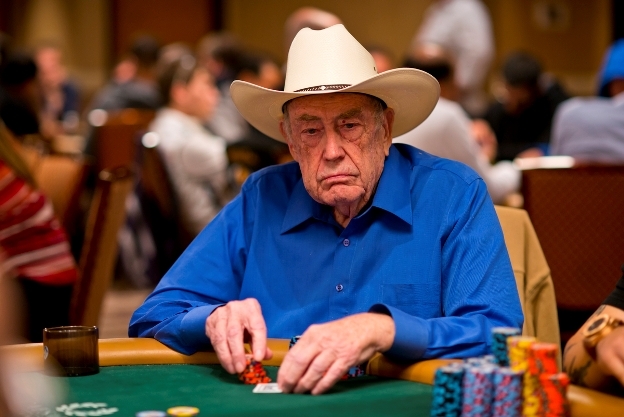 There aren’t many bigger names in the poker world than Doyle Brunson. Now in his 80’s, Brunson has been a pioneer of the game for half a century. Well before the internet poker era or even computers had been invented. Back in those days there wasn’t much information around on playing poker. So Brunson literally wrote the book on the game. American family and was always strong at school. However in his early years he was a particularly good athlete, with a focus on basketball as well as track and field. He was so good at the former, in fact, that he earned a scholarship to to play at Hardin-Simmons University in Texas. At the time, Brunson even flirted with the idea of turning professional and had been scouted by some pro teams. At the time Bruson had begun getting involved with poker, and with all his newfound spare time, he started to excel at the game. Much of the money he was making playing poker on the side was used to pay his medical bills. After graduating from college with an education degree, Brunson failed to get a job in the field of his choice. Instead, he began working at a machinery company as a salesman and continued playing poker on the side. hours. From that point onward he never worked again and his professional poker career began. In the 1950’s in Texas poker wasn’t the big business that it is today. If you wanted to find a card game you had to go and seek one out. However, in that era most of the games were run by gangsters and other organised crime figures. That didn’t seem to worry Doyle Brunson. He started building up his bank by playing in saloons all across Texas. He would travel on the road with some other poker buddies and enter tournaments, enjoying plenty of success. Too much success in fact. Given the types of characters Brunson was coming up against, many being common thieves and career criminals, he often had a gun pulled on him after a big hand. Being so good at the game, he was regularly accused of cheating and had his life threatened many times. Around the same time, Las Vegas began transforming into corporate run, gambling haven that it is today. It was then that Brunson felt that the time was right to take his skills on the road. Since the inception of the World Series of Poker, Brunson has played in nearly all the main events. He was the eventual champion in both 1976 and 1977. In 1976 he was heads-up against Jesse Alto, and had a 10-2 hand. He went on to make a full house and win the title. The following year in 1977, he again had a 10-2 hand at the final table, where he went on to hit another full house and build a decent stack that helped him go on to win. Over the years Brunson has taken out 10 WSOP bracelets and was the first player to win $1 million. Over his career he has more than $6 million in tournament earnings. He also authored the Bible of poker, ‘Super Systems’ in 1979 and has sold over 300,000 copies. Doyle Brunson might be the grandfather of poker these days, but he had to work his way up from the very bottom. He took on all comers and, for the most part, has come out on top.